What shall I render You for the gift of gifts? was born, like me that I might become like Him. when I cannot rise to Him He draws near on wings of grace, to raise me to Himself. when Deity and humanity were infinitely apart He united them in indissoluble unity, the uncreated with the created. as man to die my death. embrace Him with undying faith. In Him You have given me so much that heaven can give no more. Adapted from The Valley of Vision: A Collection of Puritan Prayers and Devotions, edited by Arthur Bennett. Where do we get the tradition of Christmas trees? All over the world, people are putting up Christmas trees for the holiday. But what does this have to do with the birth of Jesus? Is it just a pagan practice, or can we find Christ in the Christmas tree? Where did the tradition of the Christmas tree come from? There are many different stories, since ancient peoples have made use of trees and even worshiped them. One of my favorite stories is of St. Boniface, the missionary to the Germans in the 8th century. Boniface told them about Jesus Christ, but they worshiped a great oak tree. So Boniface boldly went to the oak with an ax and began to chop it down. They were ready to kill him, when a great wind came and blew the tree down. After that, the Germans converted to Christianity in large numbers. Some legends tell that St. Boniface later decorated a fir tree to represent Jesus instead of their pagan gods. It is uncertain whether this is true. During the Middle Ages, there was a popular medieval play in western Germany about Adam and Eve and a “paradise tree,” which was a fir tree hung with apples, that represented the Garden of Eden. Germans set up paradise trees in their homes on December 24, the feast day of Adam and Eve. They hung wafers on it, representing the bread of Christ in the Lord’s Supper, and then later they hang cookies, and often put candles, symbols of Christ as the light. Meanwhile, in the 15th and 16th century in Latvia, Estonia and northern Germany, there was a tradition of bringing an evergreen tree to the town square on Christmas Eve, dancing around it, and letting it burn. Eventually people in Germany began to light a tree on Christmas Eve with candles. Lutheran tradition says that the Protestant reformer Martin Luther helped popularize the lighting of an evergreen tree at Christmas all over Germany. Singing Christmas carols goes all the way back to the first Christmas, because Luke’s Gospel records four different songs as he gives the Christmas story. Let’s look at the lessons we get from these original Christmas carols. Mary’s song reminds us that in Christ, God remembers the forgotten. Mary was a poor girl, and Jesus was born in a feeding trough. The song should remind us to stop and give a donation to the Salvation Army when we go shopping, to help Toys for Tots, and share with Operation Christmas Child and Backpacks for Appalachia. The Christmas child shoe boxes and backpacks are a wonderful way to share Jesus with the poor at Christmas. Not only was Jesus’ birth a miracle, but the birth of John the Baptist, who was the forerunner of Christ, was also a miracle, because his parents were way too old to be having children. Yet an angel appeared to Zechariah to tell him that his wife Elizabeth would have a child in her old age. When John the Baptist was born to them, Zechariah broke out into a song of praise. It is found in Luke 1:67-79. Zechariah’s song emphasizes that Christ came to save us. Luke 1:68-69 says, “Praise the Lord, the God of Israel, because He has visited and provided redemption for His people. He has raised up a horn of salvation for us in the house of David.” In the Bible, a horn was a symbol of strength. The Messiah was to come from the family line of King David. So Zechariah was singing about the same thing his son would prophesy when John the Baptist saw Jesus, and John proclaimed, “Here is the Lamb of God who takes away the sin of the world!” (John 1:29). Zechariah’s song reminds us that Christ came to save us from sin. The good news is that the most reliable ancient manuscripts do not say what the KJV says. That is why the HCSB translates it, “peace on earth to people He favors!” You see, Jesus’ coming is not a general guarantee that everybody will have peace. The more accurate translation does not say peace to all men, but peace to people He favors. That is, peace is available to those who receive God’s grace, or favor, through faith in Christ. As Romans 5:1 says, “Therefore, since we have been declared righteous by faith, we have peace with God through our Lord Jesus Christ.” On Christmas Eve, 1914, during World War I, the British, French and German armies laid down their arms and visited with one another in peace, and they all sang “Silent Night” in their own languages, as they all knew the song. The message about the Prince of Peace made all the difference, even in the midst of war. Have you found the peace of Christ? The angel’s song reminds us that Christ came to give us peace, a peace we receive by faith in Him. There is one more Christmas song in Luke’s Gospel. Officially, it was after Christmas, since it happened a few days later. A lot of people get the post-Christmas blues after Christmas is over. They get kind of sad, taking down the Christmas tree and putting away the decorations. And we rarely sing Christmas carols after Christmas Day. But Simeon did. A few days after Jesus was born, Mary and Joseph took Jesus to Jerusalem to dedicate Him to the Lord in the temple. There they met a prophet named Simeon, who had been waiting all of his life for the Messiah to come and save His people. Luke 2:26 says it had been revealed to him by the Holy Spirit that he would not die before he saw the Messiah. When he saw Jesus with Mary and Joseph, Simeon took Him in his arms and sang the fourth Christmas carol. In that song, Simeon reminded us that to keep Christmas with us, we must share it. We read the song in Luke 2:29-32. Simeon knew that the salvation that is offered in Jesus Christ was prepared for “all peoples,” both Gentiles and Jews, and he wanted everybody to know that the baby Jesus that he was holding in his arms was the Savior. Simeon’s song reminds us, to keep Christmas all year long, keep on sharing the good news. Christmas carols that celebrate Jesus may not be in the top 20, but people still recognize the songs and enjoy hearing them this season of the year, which is all the more reason for us to play carols in our homes and cars and places we work. It’s a simple way to share the good news. And how we need to renew the tradition of going Christmas caroling! I have a suspicion that if Zechariah and Simeon and Mary were with us today, they would be going door-to-door caroling, with some shepherds right behind them and angels overhead. Years ago, a small group of carolers went door-to-door in a wealthy neighborhood of Beverly Hills, California. They rang a doorbell, and the man of the house answered, all in a hurry. He said, “Look, I appreciate the sentiment, but I really don’t have time for this. The house is a mess and we’re trying to get out the door to go shopping. Come by some other day.” As he shut the door, Bing Crosby and his family said, “Okay,” and left. God sent His Son at Christmas. Don’t be so busy you miss the song. Perhaps the three most popular Christmas carols in English are “Joy to the World,” “Hark! The Herald Angels Sing” and “Silent Night.” The first two were sung in the American colonies even before the United States was a nation, but the third one came from Austria. “Joy to the World” was written by Isaac Watts in 1719. It is based on Psalm 98, and its tune comes from one of the songs in Handel’s Messiah. Originally this song was intended to refer to Jesus’ Second Coming, but it has come to be associated mostly with His first coming at Christmas. “Silent Night” was originally written in German and first sung on Christmas Eve, 1818, at St. Nicholas Church in the village of Oberndorf, near Salzburg, Austria. The organist, Franz Gruber, discovered that the organ wasn’t working at the church. The priest, Joseph Mohr, had composed the words in German to “Silent Night” two years before. So he shared it with Gruber, who composed the tune to be sung by guitar. When Karl Mauracher came to repair the organ, he heard the story of how the song was composed in an emergency and sung without the organ, and Mauracher spread the song everywhere that he went. The song came to America by German-speaking congregations. Originally the words were “Stille Nacht, Heilige Nacht.” The English words we sing today were translated by John Freeman Young. “Silent Night” has been translated into 140 languages. While many Americans sing about Santa, chestnuts and a white Christmas, Christians all over the world have sung about the birth of Jesus Christ for centuries. As early as the fourth century, Ambrose, the archbishop of Milan, wrote a hymn for Christmas to teach that God truly became a man, in response to heretics who denied Jesus’ incarnation. Singing Christmas carols was popularized by St. Francis of Assisi during the Middle Ages in Europe, and was also encouraged by the Protestant Reformers, such as Martin Luther. As early as the 15th century, groups of singers would go from house to house in England and sing Christmas carols. Christmas carols in English first appear in a 1426 work of John Awdlay, chaplain from Shropshire, who lists twenty five “caroles of Cristemas”, probably sung by groups of “wassailers,” who went from house to house and enjoyed “wassail,” ale, or apple cider, and other desserts given to them at each home. Thus we get the line, “here we go a wassailing among the leaves so green,” and since the homes often fed the carolers, we also get the line, “bring out the figgy pudding, we won’t go until we get some.” It was only later that carols begun to be sung in church, and to be specifically associated with Christmas. Two of the oldest Christmas carols still sung today are “O Come, all ye faithful,” which was originally written in the 13th century, and “Good Christian Men, Rejoice” which was first composed in the 14th century. Many people enjoy displaying the Christmas cards that they receive during the holiday season, but what do they do with them after the New Year begins? Stick them in a drawer? Throw them away? Several years ago, my wife Mary and I adopted a simple tradition of praying over our Christmas cards in the New Year. When we receive Christmas cards, we enjoy looking at them, and then put them in a basket. We place the basket on our dinner table, and sometime in early January, we begin to pray for the people who sent each card, one card at a time, one week at a time. Here’s how we do it: On Monday evening when we sit down to eat dinner, we draw a Christmas card from the basket and look to see who sent it. We share memories of that person or family, and needs they may have. Then as we say the blessing for our meal, we include that household in our prayers. We pray for them at each dinner that week. The next week, we draw the next card from the basket, praying for that family each day of that week. We continue the process throughout the year, and sometime in the fall we empty the basket, as we finish praying for all of the people who sent us cards. Then the basket is ready to refill during the next Christmas season! Many times we have drawn a card and prayed for somebody at just the time that we know that person has a special need. At other times, we have prayed for them with no idea what they are going through, only to learn later that the timing was perfect. Of course, there is no bad time to pray for another person! This simple tradition has been a blessing to us, too. During the busy Christmas season, we have little time to savor each Christmas card when we first receive them, but later in the year, we have a whole week to reflect on each and every one. It’s an easy and meaningful tradition that you could adopt in your own home. Ever since the star of Bethlehem led the wise men to baby Jesus, Christmas has been associated with lights. For centuries, Christmas lights meant lighting candles. The tradition of putting up Christmas lights began with putting candles on Christmas trees. Christmas trees originated in Germany by the 16th century, from several different traditions. Some Germans actually burned an evergreen tree in the town square and danced around it. There is a popular legend that Martin Luther, the German Protestant reformer, began the tradition of putting candles on Christmas trees. The legend says that one crisp Christmas Eve, about the year 1500, he was walking through snow-covered woods and was struck by the beauty of a group of small evergreens. Their branches, dusted with snow, shimmered in the moonlight. When he got home, he set up a little fir tree indoors so he could share this story with his children. He decorated it with candles, which he lighted in honor of Christ’s birth. Whether or not this is true, we know that the Advent wreath was invented in 1839 by Johann Henrich Wichern, a Protestant pastor who worked with the urban poor in Germany. The children would ask every day if Christmas had arrived, so Wichern built a ring with evergreen and candles to candles to light the 24 days in December before Christmas, and large candles to mark the Sundays. Later this was simplified to four candles for the four Sundays, and a Christ candle in the middle for Christmas Eve or Christmas Day. The custom of lighting an Advent candle did not spread to America until a century later, in the 1930s. On December 22, 1882, Edward H. Johnson, vice president of the Edison Electric Light Company, displayed his Christmas tree with 80 red, white and blue electric lights bulbs the size of walnuts, at his home on Fifth Avenue in New York City. This was the first time a Christmas tree had been illuminated with electric lights, but the idea spread quickly. Three years later, the White House Christmas tree was covered with electric lights. By the early 19th century, it became popular to put lights on buildings, not just on Christmas trees. In the 1960s, with the construction of so many subdivisions in American communities, it became the custom in American neighborhoods for many families to cover their houses with lights. This custom has spread around the world, and is particularly popular in Japan. Today, Christmas lights cover waterfronts, caverns, skyscrapers and shopping centers. Some even use synchronized timers to have their lights flash to music. May each light remind us of a star long ago that led to Jesus, the Light of the world! Parents and grandparents often look for great books to share with their children at Christmas. Here is what I consider to be four of the best children’s Christmas books. One is sentimental, some are humorous, and one will help a child deal with suffering. One of my favorites is Alabaster’s Song: Christmas through the Eyes of an Angel by Max Lucado. It tells the story of a boy who believes he hears the angel on the Christmas tree singing. Then miraculously, the gap-toothed angel appears by the boy’s bedside, a boy like him, and tells him what it was like to sing to baby Jesus. Children of all ages will enjoy this book, but parents, watch out, because you may get a lump in your own throat at the way the story ends. In my list of favorite children’s Christmas books, I have to include the classic book that I loved when I was a child, How the Grinch Stole Christmas, by Dr. Seuss. This beloved book has been made into a popular cartoon TV show, that includes the song, “You’re a Mean One, Mr. Grinch.” In recent years, a live-action movie was also made, but I still prefer the cartoon that follows the book word-for-word. It is hard to improve on the whimsical rhyme of Dr. Seuss. The changed heart of the Grinch has put the word “Grinch” next to “Scrooge” in the Christmas vocabulary of the English language. Every child deserves a chance to hear a parent or grandparent read it to him or her directly from the book, and follow it with a heartfelt discussion about the real meaning of Christmas. My third selection is Cajun Night Before Christmas, by “Trosclair,” edited by Howard Jacobs. This is a regional favorite in Louisiana, but I have read it to children in Georgia who loved it. I have read this story aloud to my family and to children in public schools over the years, and it always produces loud laughter, even among those who aren’t familiar with the Cajun culture. There have been many imitations of this book, such as the Cowboy Night Before Christmas and the Redneck Night Before Christmas. But none have surpassed the originality and pure fun of Cajun Night Before Christmas. My final selection is All Is Well: A Story for Christmas, by Frank Peretti. Peretti is the best-selling author of the Christian thriller This Present Darkness, but he is also the author of one of the most touching Christmas books for children that I have ever read. All Is Well is different from other children’s Christmas books for several reasons. It is on the reading level of an older child, perhaps about fifth grade. It is on the emotional level of a single mom who is struggling to make ends meet at Christmas. The story takes place in July, not during the Christmas season. Yet is most certainly a Christmas story, especially for those who going through tough times during the holidays. If you are looking for a cute Christmas book for your child, this is not your book. But if you need encouragement to make it through Christmas, this may be the best book you could read, especially to a child who doesn’t understand why God is allows suffering and hard times. Below is a “True/ False” Christmas Trivia Quiz, developed by the chaplains at the hospital where I work. See how many you get right. Click on the “Comments” below to read the answers in the first comment. 1. John’s Gospel names Bethlehem as the birthplace of the Messiah. 2. The name, “Jesus,” was not prophesied in the Old Testament; rather, it was given to Mary by the angel for the Christ-child. 3. The Bible does not provide any clues as to when Jesus was born. 4. Jesus was born in the year 1 A.D.
5. Gabriel was the angel who informed young Mary that she would miraculously conceive a child through the power of the Holy Spirit. 6. According to the Luke’s Gospel, the angel Gabriel told Joseph to not be afraid to take Mary as his wife. 7. The Bible says that Mary rode to Bethlehem while pregnant with Jesus on a donkey. 8. Angels announced Jesus’ birth to shep-herds in the fields nearby. 9. The Magi, or Wise Men, brought gifts to the newborn King on the night of His birth. 10. According to Matthew’s Gospel, the Magi brought gifts of gold, frankincense and myrrh. 11. According to the Bible, Jesus was circumcised on the 8th day of his life. 12. Simeon was the name of the righteous man who blessed Jesus in the temple in Jerusalem. 13. Herod was the evil King who ordered all male children under the age of 2 in Nazareth to be slaughtered in an attempt to kill Jesus. 14. Joseph and Mary fled to Egypt in the middle of the night after being warned by an angel in a dream. 15. Early Christians did not celebrate the birthday of Christ. Why do we celebrate Jesus’ birth on December 25? Since nobody knows the exact date of Jesus’ birth, why do we celebrate Christmas on December 25? The answer to that question is submerged under a haze of mystery. An early father of the church, Cyprian, said in 243 that Christ was born on March 28, the spring equinox, for “on that day which the sun was made on the same day was Christ born.” However, Christ’s birthday was not celebrated until the fourth century, and when the tradition of Christmas began, the date of December 25 was preferred in the West, while January 6 was preferred in the East (a date that is still preferred by Eastern Orthodox Christians). The earliest known reference to celebrating Jesus’ birth on December 25 was in the Philocalian Calendar, a list of martyrs of the Roman Church, written in 354 but reflecting practices in 336. In 376, the bishop of Rome first required churches to keep the nativity festival on December 25. In 386, John Chrysostom refers to the date of the December 25 festival by saying, “It is not yet the tenth year since this day has become clearly known to us.” Ironically, Christmas was celebrated in Bethlehem on January 6 until the sixth century (since Bethlehem was under the influence of the Eastern tradition). After the sixth century, Bethlehem celebrated Christmas on December 25, because Emperor Justin II (565-578) ordered the celebration of Christmas on December 25 throughout the Roman empire. There are two major theories of the origin of these dates: one with pagan roots, and one with Christian roots. The most commonly accepted theory is that the date was chosen, perhaps by Emperor Constantine, to divert the attention from pagan holidays. Emperor Aurelian had established a pegan winter solstice festival on December 25, 274, and he probably dedicated a temple to the sun god on that date. The birth of the Persian god Mithras, identified with the sun, was celebrated on December 25. Egyptians celebrated the birthday of the sun god Aion on January 6. Many people contend that Christmas should not be celebrated because of this possible connection to these pagan origins. Ironically, some of these same people will themselves seek to replace the pagan celebration of Halloween with a Harvest Festival at their churches, in much the same way as they claim the early Christians celebrated Jesus’ birth to replace a pagan holiday. Thomas J. Talley, in his book, The Origins of the Liturgical Year, argues that the dates of both December 25 and January 6 can be explained from Christian origins. In rabbinic thought, it was common to remember the conception and death day of patriarchs on the same day. By putting Jesus’ conception on the Jewish day of 14 Nisan (March 25 on the Western calendar and April 6 on the Eastern calendar), His birth nine months later would be either December 25 (according to the Western calendar) or January 6 (according to the Eastern calendar). Thus the birth of Christ could have been set “without reference to pagan public celebrations,” says Talley. 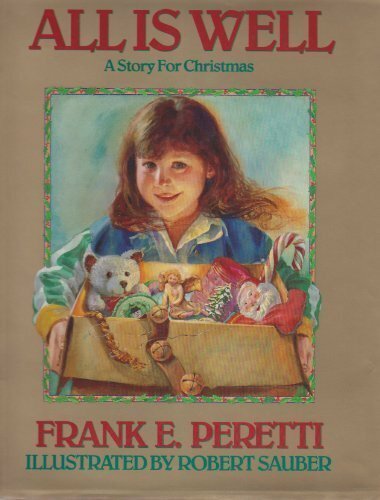 Frank Peretti is the best-selling author of the Christian thriller This Present Darkness, but he is also the author of one of the most touching Christmas books for children that I have ever read. All Is Well: A Story for Christmas is different from other children’s Christmas books for several reasons. It is on the reading level of an older child, perhaps about fifth grade. It is on the emotional level of a single mom who is struggling to make ends meet at Christmas. The story takes place in July, not during the Christmas season. Yet is most certainly a Christmas story, especially for those who going through tough times during the holidays.